University of Washington's Sapna Cheryan has just been named to the Barbie Global Advisory Council. She's studied gender for 15 years and will bring that expertise to the job, aiming to help Barbie have more social impact with girls. She comes fitted with clenched fists for fighting off “grabbers” and bendable knees that fit squarely into the crotch of whoever gets too close. “Right,” Cheryan said with a laugh. Or maybe “Human Resources Barbie,” who comes complete with her own training room, where knuckle-headed Ken dolls can be placed in chairs and taught what “no” means. It was worth a try. For Cheryan, an associate professor at the University of Washington’s Department of Psychology, has just been named to the Barbie Global Advisory Council, “a collective sounding board for the brand,” according to Barbie’s parent company, Mattel. Cheryan, 40, seems a perfect choice for the one-year position. Along with her teaching, she has been studying gender for 15 years, and is the director of the UW’s Stereotypes, Identity and Belonging Lab. She has also given public lectures in which she explains how “Computer Engineer Barbie” came to be. Mattel gave girls a chance to vote on which Barbie they wanted to see next in its “career” series: Computer Engineer Barbie or News Anchor Barbie? 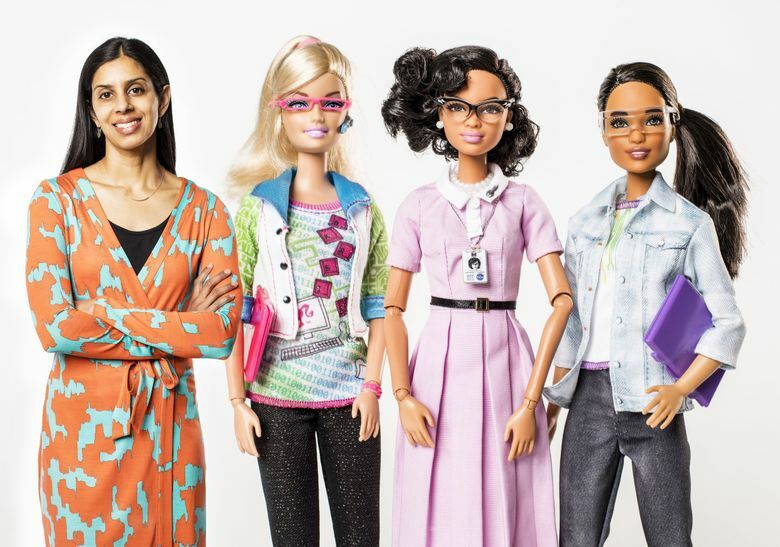 Women in tech overwhelmed the results, giving the data-minded Barbie the popular vote. But young girls still liked — and voted for — the News Anchor. So Mattel produced both. Her data backs this up, showing that women are more likely to get undergraduate degrees in biology (50 percent are female) and almost as likely to degree in chemistry (47 percent) and math (45 percent). But when it comes to Computer Science and Physics, those percentages drop to less than 20 percent. So when Cheryan saw that Mattel’s newest “Career of the Year Barbie” was a Robotics Engineer, “I was like, ‘Great. That’s the field where we need more role models,'” she said. “‘Biology Barbie’ is still good, but if we’re trying to reduce women’s under-representation, we need to do more. And don’t think Barbie doesn’t have that kind of pull. That 59-year-old little doll (whose Twitter profile places her in Malibu, of course) has some of the largest brand recognition in the world. “But by her changing her careers, she can change a girl’s choice?” Cheryan asked. “I don’t know. But from my perspective, one of the reasons women are under-represented is because the image of the field makes girls feel they aren’t welcome there. There have been a few snags. In one book, Barbie is quoted as saying “Math is hard!” and Computer Engineer Barbie didn’t write her own code. She asked a male engineer to do it for her. Now she owns more than her own 6-year-old daughter. So they may want to hold off on “Brass Knuckle Barbie,” then? OK. Never mind.